There are two different types of macular degeneration, dry and wet. Dry macular degeneration is the more common form of this condition. Symptoms include blurry distance and/or reading vision, less vivid color vision, difficulty seeing in dim light, trouble recognizing the faces of loved ones and a blank or blurry spot in your central vision. It is possible for the dry form of macular degeneration to affect either one or both eyes. If it only affects one eye, you may not notice it because the other eye will compensate for it. The wet form of macular degeneration is more rare and generally understood to be more dangerous due to it's tendency to deteriorate very quickly. Some symptoms of wet macular degeneration are similar to those of the dry form, such as seeing less vivid colors and loss of central vision in general. You may also see straight lines as though they are bent, crooked or irregular. It is very important to have regular eye exams so that your optometrist can monitor any changes in your eyes that may signal macular degeneration. During your exam, our macular degeneration expert in Seattle area, Dr. Cusic will examine your retina and other parts of the back of your eye to see if there is anything unusual. 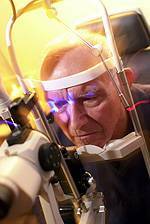 If he detects macular degeneration, Dr. Cusic may use a device called an Amsler Grid to check your symptoms. Although there are no federally approved techniques to treat macular degeneration, many expert studies show a link between taking certain health supplements and reduced risk of macular degeneration. Many Seattle and Kirkland residents come to our optometrist, Dr. Cusic, and he speaks with them about the uses of Vitamin C, Vitamin E and other healthy supplements in helping reduce their risk of developing macular degeneration or of their dry macular degeneration getting worse or developing into the wet form. For more information about macular degeneration treatments and glasses in Seattle area, make your appointment with Dr. Cusic today.